First in York in partnership with City of York Council has introduced six new electric Optare Versa EVs to the Monks Cross P+R service 9, the second P+R service in the city to be fully operated by zero emission at point of use vehicles. Following their successful entry to service earlier in the month, the vehicles were formally launched on 19 May by representatives of First, City of York Council and Optare. Much earlier that morning, before the start of the day’s service, First had positioned all six vehicles for a group image outside York’s iconic Clifford’s Tower. 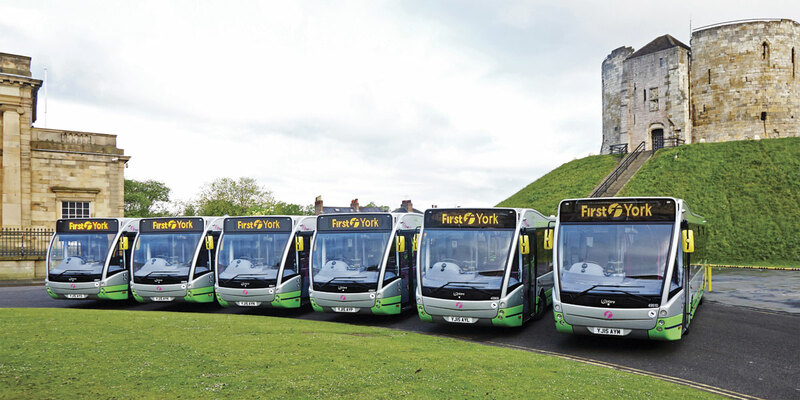 First has invested almost £1m in the six Optare Versa EVs, supported by Green Bus Funding of approximately £566,000 from the Department for Transport. 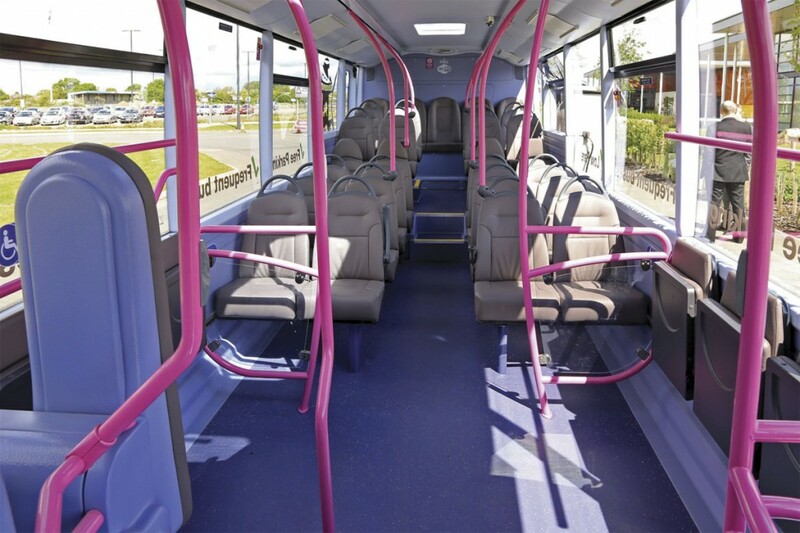 The 11.085m vehicles are equipped with 36 E-leather trimmed seats, six of them tip-ups in the low floor area which alternatively takes a single wheelchair and two buggies. A prominent notice in the passenger waiting area advises on the type of motorised wheelchairs and disability scooters which are accepted on board. The maximum gross vehicle weight including a maximum 22 standees is 12,500kg. 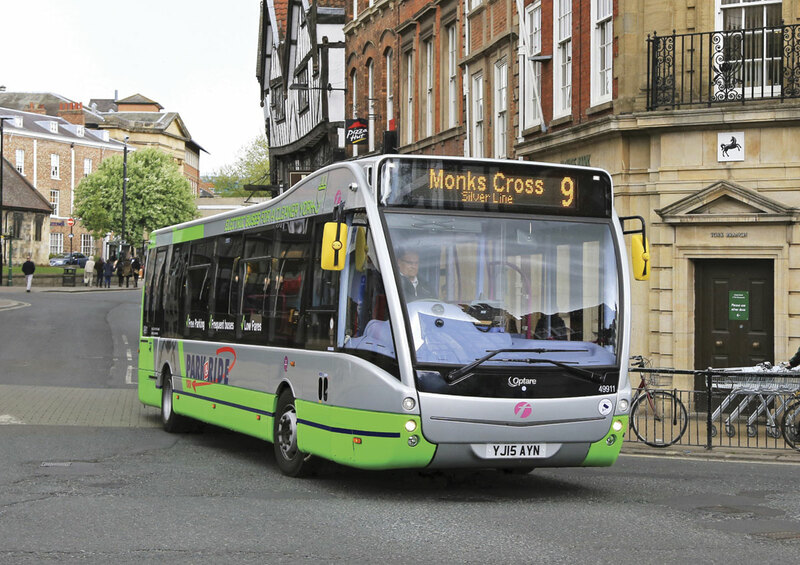 Like all the electric buses in York, they feature Magtec’s 150kW electric motor and lithium iron magnesium phosphate battery packs. These allow a range of 70 to 90 miles following a single overnight charge at the depot, which also ensures that the batteries are balanced. The batteries are topped up during the day using the rapid charger located at the Monks Cross P+R site which increases the range to 120 miles per day. Five of the Versa EVs are required to maintain the service headway with the sixth receiving its top up charge. First has documented clear safety procedures for the top up process supported with training of all relevant staff, a copy being displayed prominently on the charging point. 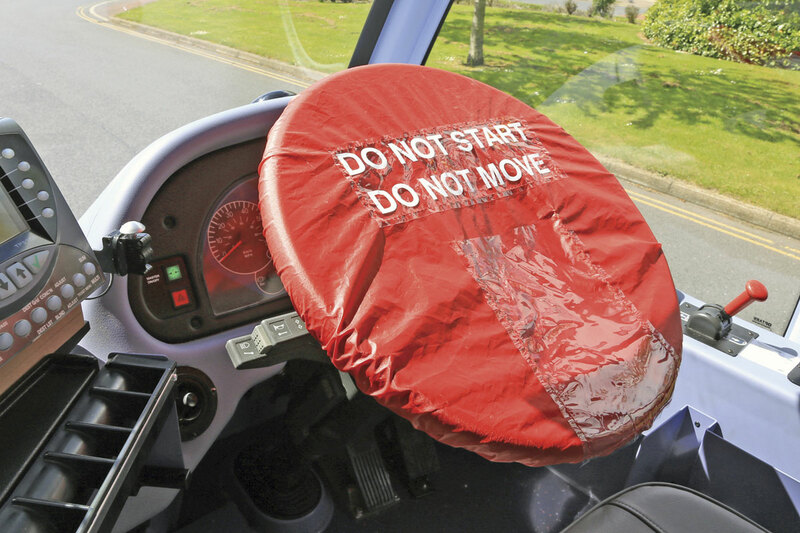 One of the requirements is to apply a red cover to the steering wheel clearly defining that the vehicle is not to be started or moved during the charging process. Monks Cross P+R is one of York’s six P+R sites, situated on the city’s eastern boundary and aimed at reducing the number of vehicles entering the city along the A64 from the east coast. It is located within a growing business, leisure and out of town shopping development which in turn generates a significant reverse passenger flow. Until recently this was served directly by the service 9 before arriving at the P+R site but with further development and growing congestion at certain times, the route has been split with the 9 service running directly to the P+R site to enable maintenance of a regular headway into the city. A shuttle service 99 now links into the shops and offices with some vehicles running through. A ten minute or better headway is standard on service 9 between 0700 and 1943 Monday to Friday with a similar service on Saturdays except for a slightly lower early morning frequency. Sunday has a twelve minute service fom 0930 to 1754. 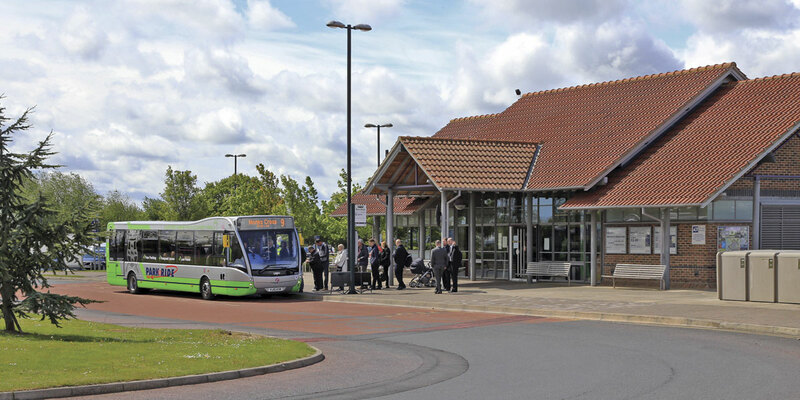 Developed by City of York Council, the P+R site has a dedicated terminal building with a spacious waiting room including toilets for passengers and accomodation for First’s site supervisor. The 750 space car park is barrier controlled with tokens validated on board the service 9 bus. Non bus users, excluding those continuing by cycle, pay £5 per day. There is an area outside of the barriers for coaches and visitors with caravans and motorhomes. The whole area is covered by CCTV. Further development in the area, including a new combined ground for York’s rugby and football clubs together with an entertainment complex, will require partial relocation of the car park areas. The site currently has a single charging point for the Versa EVs which is situated on the far side of the landscaped area from the terminal building, necessitated by the present availability of suitable connections to the electric distribution network, being adjacent to car charging points installed in the nearby shopping centre car park. 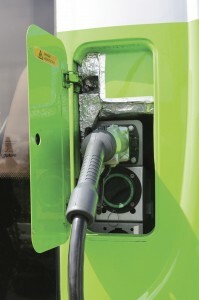 Subject to suitable electric distribution network capacity, City of York with support funding from OLEV (Office for Low Emission Vehicles) intends to relocate the charging point closer to the terminal building, installing two Siemens charging points and facilitating easier supervision of the charging process. 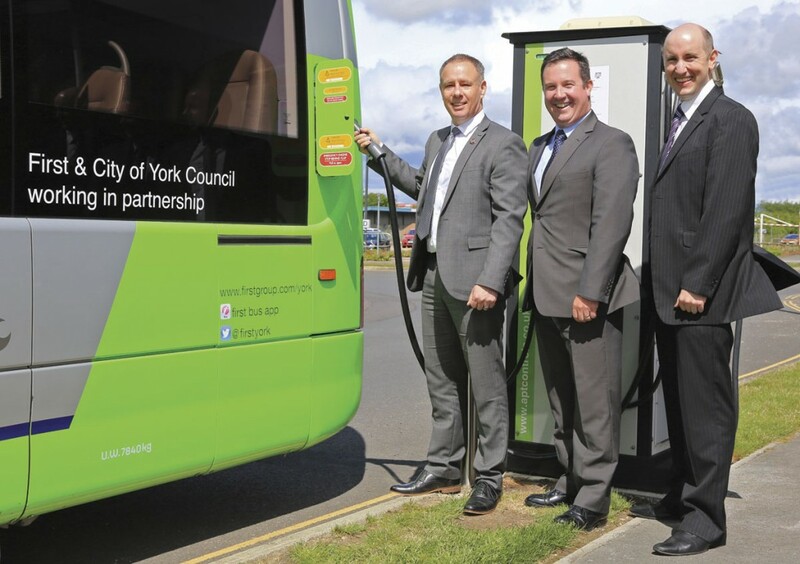 At the initial launch of a converted Transdev/City Sightseeing electric double-decker in September 2014, City of York Council outlined its Low Emission Strategy, which had been the first of its kind in the UK when published in 2012. The Strategy aims for 80% of operations to be fully electric by 2018 subject to funding and also extends to other passenger vehicles. The City already has its first all electric taxi in service alongside 17 hybrid taxis. Andrew Bradley confirmed that the programme was on track with 14 electric buses now in regular service, twelve First Versa EVs on two P+R services, the Transdev Solo EV on a University service and the first sightseeing double-decker conversion that is now in regular use with Transdev. 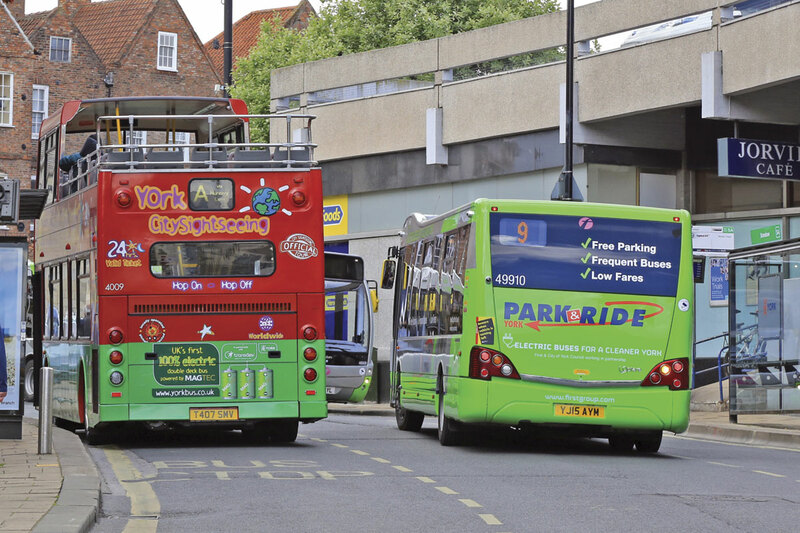 Funding has recently been secured to convert the remainder of Transdev’s City Sightseeing York double-deck fleet to electric power bringing the total electric fleet to 19. The overlap of services means that key city centre streets including Rougier Street and the Ouse Bridge will see up to 30 electric vehicle movements per hour throughout the day. The city continues to work with operators and manufacturers to develop applications for further government LEV funding. In addition to its low emission aims, York is looking to establish itself as one of the best digitally connected cities in Europe in 2015. In support of this, all six Park&Ride terminals and the vehicles on the services linking them to the city centre have free Wi-Fi, following on from the success of a free Wi-Fi access pilot in the city centre. 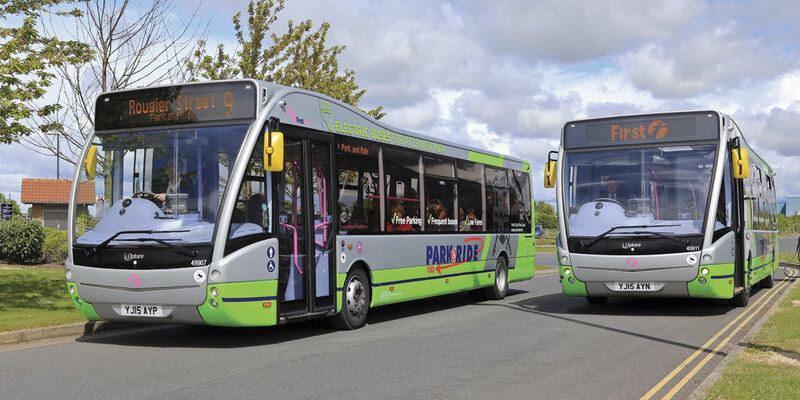 With the introduction of EVs to a second of its City of York P+R tendered park and services, First has demonstrated a significant commitment to meeting City of York Council’s Low Emission Strategy. Delivering in line with that Strategy is likely to be a key factor in the re-award of the P+R service contracts due in 2017.